What a perfect mixture of fun, sarcasm and nostalgia. Leto's essays vary from stereotypical assumptions of people and the books they read, to personal memories of chasing the seventh Harry Potter book in Japan and a vivid declaration of love for the printed word and tangible books instead of e-books. Leto is a dedicated and avid reader, a lover of classic novels as well as "light entertainment". She is witty, intelligent and perfectly ironic; and her love for books shines through every single word that she writes. "Life happens alongside the act of reading — a story is forever mixed with where we were and what we were doing while we were reading that book." I especially adored her petition to change the term 'bookworm' to 'bookcat'; the resemblances between readers and their cats are so accurately observed. Her chapter on the certain bookstore smell is beautiful as well; it describes every single reader's love for buying, holding and touching books. The chapter called "Stereotyping People by Favorite Author" made me burst with laughter; it is so witty, so snarky and so funny. It may require a bit of self-irony to fully appreciate Leto's humor, as she picks on several popular authors - but there's a grain of truth in every point she makes, and it is impossible not to recognize a few bits from your own prejudices. 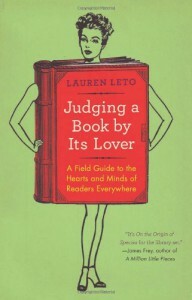 Leto's rewriting of "Rules of Fight Club" to "Rules of Book Club" is hilarious as well! Even my non-reading boyfriend couldn't stop laughing. However some of the chapters felt a bit too repetitive for my taste. I almost skipped the entire chapter on "How to Fake It", as I have no interest in reading summaries of books, I've already read. I also skipped the Twitter-sized reviews as I thought I'd already read it before. "Loving young adult novels well past adolescence isn't a sign of stunted maturity or intelligence. The most important thing about reading is not the level of sophistication of the books on your shelf. There is no prerequisite reading regimen for being a bookworm."